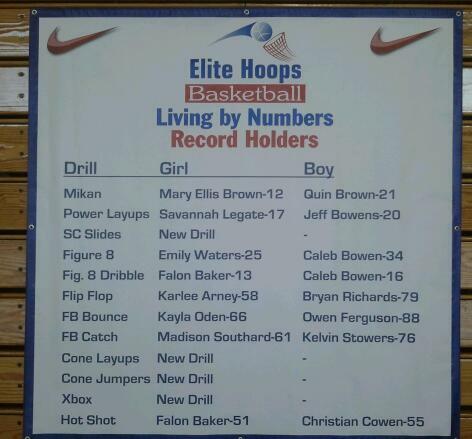 Elite Hoops Basketball: Are You Living by Numbers, Really? Each player's scores were tracked by their coach, and entered into the Living by Numbers Database found on the Elite Hoops website. At camp, player's were told that their scores found in the Living by Numbers Database were to act as a "baseline score" or an individual goal, as they worked on these drills daily to improve before tryouts. For our staff, the idea behind this was that if players track their scores daily, they will no doubt see tangible improvement in each drill over time, and hopefully, want to continue to get better as they set higher and higher goals for themselves! Is that happening though? It is time to find out! If you were one of the players that attended our NIKE basketball camps this summer, be honest with me for a second, as I ask some questions about your off-season training and your Living by Numbers scores. Have you been working on those drills daily? Have you been timing yourself to create a pressure situation? Have you been recording your scores daily? If so, are you seeing improvement? If not, why haven't you been working on each one of these drills daily? If you answered "Yes" to questions 1-4, that is great, and I applaud your hard work, effort, and commitment to the game! And you are probably seeing improvement over the first time you did the drills in camp, so well done because we all know that "hard work brings prosperity!" For those of you who haven't been working on your Living by Numbers drills daily, and answered with "No" or "Kind of" or "Sometimes," today is the day to stop making excuses! Although we all have them, an excuse isn't going to do you any good when tryouts come and you aren't prepared, or your season comes and you miss open layups because the pressure of the game gets to you! Luckily, there is still time! You still have over a month before tryouts or before practice starts, so go to your Living by Numbers scores on the website, dust them off, and start working to make-up for the valuable time you have lost! Although you haven't been working like you should have been over the summer and now into fall, all is not lost. Work on preparing NOW, so that you stand out in a tryout and are prepared to hit the ground running when your season starts! The time for you, as an individual, to get better comes in the off-season because during the season, your coach's focus is on the "team" getting better. So practices consist mostly of team offense and team defense work, not about getting 200 shots up, or working on ballhandling, or individual quickness. You need to work on YOUR game NOW, before the season even starts! So I say all this to say, that you need to use the next 6 weeks to get yourself the individual work that you need to improve. Take your Living by Numbers scores seriously and working on them daily! If you do this, I can't promise you will make your team or make every layup, but I can tell you that your chance of success is much higher! Good Luck!